View More In Pogo Sticks & Hoppers. The ThinkGizmos ® Aero Advantage Is The Best Pogo Stick For Kids - Excellent Quality Construction and Made To Last. 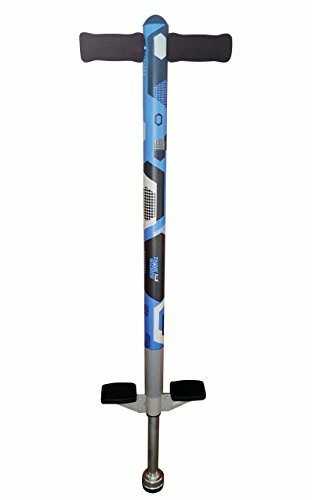 At ThinkGizmos we have been selling Pogo Sticks worldwide for almost 20 years and this Aero Advantage model is the latest in our range aimed at younger kids. The Aero Advantage Pogo Stick is our modern adaptation of the classic pogo stick toy and is built for performance, safety and stunning looks. Incorporates concealed Low Friction Spring technology for a quiet, smooth and higher bounce due to Industrial strength steel springs. This awesome stick is perfect for improving back and core strength and physical timing. The Aero Advantage Pogo Stick will keep your kids active and burning a lot of energy, and all while they are having an awesome amount of fun. Win Win! This pogo stick for boys and girls is a tried and tested device used by kids around the world for decades. Get your kids off the computer and jumping on a pogo ace pogo stick. Please always read and follow the included safety manual at all times. The Pogo Advantage Pogo Stick for kids should only be used on flat, solid surface to avoid the risk of falling. Please always use a helmet (not included) for safety reasons. Overall this Pogo Advantage model is perfect for users up to 90lbs (36kgs) mainly younger children 5-12 years old and is impressivein its build quality, performance and looks. If you have any questions about this product by Think Gizmos, contact us by completing and submitting the form below. If you are looking for a specif part number, please include it with your message.